While Canada is not releasing any specific economic reports the US is releasing Bank Stress Test Results, Crude Oil Inventories, Pending Home Sales m/m, Personal Income m/m, Personal Spending m/m, and the Core PCE Price Index m/m. USDCAD started today with bearish bias above the weekly pivot point and it seems that this pair is going to retain this pattern. 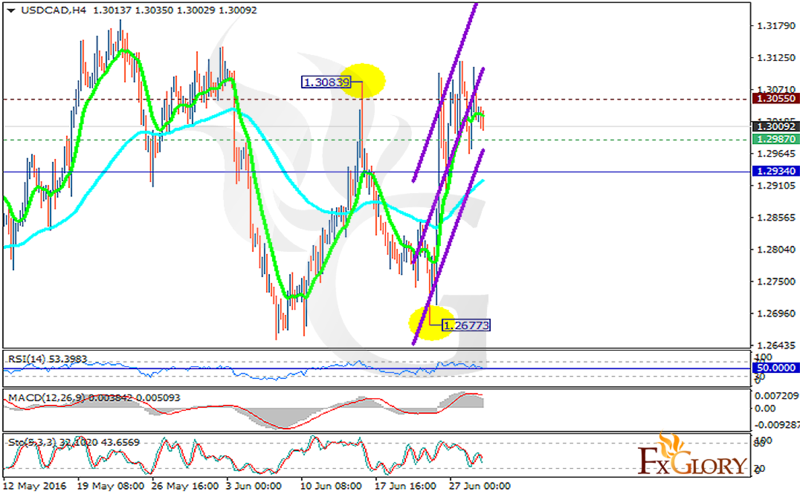 The support rests at 1.29870 with resistance at 1.30550 which both lines are above the weekly pivot point at 1.29340. The EMA of 10 is moving horizontally above pivot point and the EMA of 75 which is located below the pivot point. The RSI is moving on the 50 level, the MACD indicator is in positive territory with falling tendency and the Stochastic is showing downward momentum. The bearish trend will continue until the support level breakthrough after that long positions are recommended.